The children have to learn about The Clone Wars sometime, right? Right? Remember, in my introductory post to this series, when I said that my daughter gets to pick put one book every time that I can’t veto? Well, per usual, for her no-veto pick, she went for a book based on a movie or a TV show. Usually, that means Scooby Doo, but this week it meant… Star Wars. 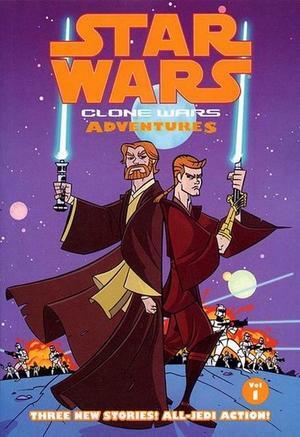 Specifically, a Star Wars comic book anthology called Clone Wars Adventures, Volume 1. And, as a big pop culture geek, Star Wars is kind of a hot button issue with me. Like a lot of people, I adore the original trilogy, despise the prequels, and beyond-despise the various unnecessary and artistically-suspect revisions George Lucas has made to the original trilogy. But, after observing my daughter’s first year of kindergarten, I have to say – there is NO other pop culture property that is more prevalent in the minds of young children than Star Wars right now. Maybe it’s the due to the popularity of Star Wars Legos or maybe it’s because the children of the ‘80s grew up, had kids, and decided to share their favorite trilogy with their offspring at a very young age, but, man oh man, in my experience, five- and six-year-old boys and girls will NOT stop talking about Star Wars. However, the Star Wars issue is difficult in our house because, while it is VERY much on my daughter’s radar, I won’t let her watch the movies or the Clone Wars TV series yet. I just think she’s too young and it’s too violent. And that’s hard because almost ALL of her friends watch the movies frequently. So, instead, since she is really, really eager to learn about Star Wars, we talk about the Star Wars universe A LOT. (Fortunately, as a card-carrying geek, I have an almost-photographic memory about Star Wars lore.) I’ll flip through Star Wars books with her and she has some Star Wars toys (including some of mine from my childhood). I also show her a decent amount of YouTube clips – a selection of short glimpses of Star Wars-related material that I deem appropriate. 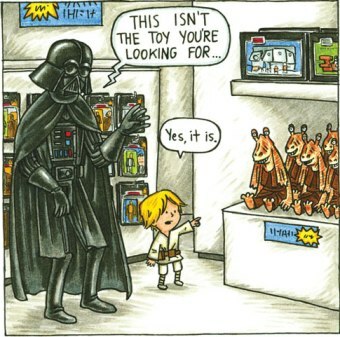 For example, there are some pretty funny animated Lego Star Wars videos online at the moment. Or there are these crazy “Star Wars Dance-Off” videos from the Disney Studios Star Wars Weekends that have to be seen to be believed. (You haven’t lived until you’ve seen Chewbacca’s Axl Rose impression.) Or, at times, I will show her small clips from the actual movies. I normally keep these short, but I have given her brief looks at lightsaber fights, space battles, Ewoks, etc. Since it is SUCH a front-of-mind topic with her peers, I have no problem sharing with her knowledge of the Star Wars universe – showing her videos, having discussions, letting her play with the toys – but I’ll be damned if I let peer pressure force me to show her the movies before I feel she’s ready for them. How do I explain Jedi haircuts to my daughter? 2. It was a graphic novel – a format that I really love and that my daughter is really enjoying. She’s very into comic books right now and Clone Wars Adventures is a neat little Star Wars comics anthology series, published by Dark Horse Comics, with three separate stories per volume. The format is also pretty cool for young readers – big readable text, only 2-3 panels per page, and the library-binding editions are hardcover and super-tough. 3. The art was great. The style of the artwork in Clone Wars Adventures is based on the original Star Wars: Clone Wars animated series – an actually extremely cool series of 2D animated shorts (SO much better than the current 3D Clone Wars series) that was designed and created by Genndy Tartakovsky, the genius creator of cartoons like Dexter’s Laboratory, The Powerpuff Girls, and Samurai Jack, to name a few. Plus the very first story in the anthology, “Blind Force”, was illustrated by artist Ben Caldwell, whom you might remember from an earlier Building a Library post – “The Trouble with Princess Books: The Strange Case of Wonder Woman.” For those who don’t remember, Caldwell was the illustrator for a series of Wonder Woman readers and chapter books that my daughter ADORES and so do I, particularly because they present some of the best non-pervy, totally girl-empowering images of Wonder Woman that I’ve ever seen. So, with those three reasons in mind, I let her check it out. I did a quick flip-through to scan for overly sexualized or violent images and didn’t find any. Once I sat down and read the anthology, I definitely appreciated the format and art, but the story…eh. It’s nothing special. The plots are simplistic. The dialogue is filled with jargon and bland declarative statements. (“Anakin!” “I’m on it, Master!” “Let them come!”) It’s fairly dull stuff. 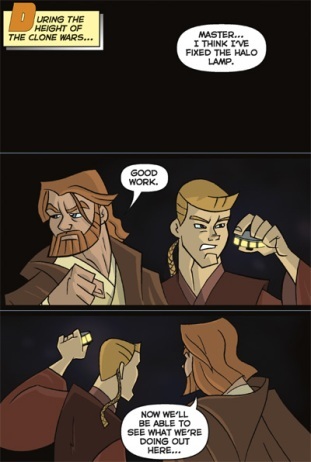 But the art does the lion’s share of the work in Clone Wars Adventures. It draws the eye, it delivers some very engaging action sequences… it works hard to engage its audience. While, yes, the writing doesn’t do its share of the effort, the package itself is well-composed enough to make it a million times more appealing than a DK Reader “This is what happened in Phantom Menace” book or most other movie tie-in kids’ books. If your young kid is interested in Star Wars and you want something age-appropriate and, at least, visually interesting enough to share with them, you could do a lot worse than Clone Wars Adventures. I realize that isn’t the most ringing endorsement ever, but these books are acting as Star Wars surrogates for me right now – fulfilling my daughter’s pressing need for Star Wars-related entertainment, so I don’t have to break down and show her the prequels – and, for that, I am very, very appreciative. Tune in tomorrow for book #4 –a very silly, very gross poetry book from the world’s first Children’s Poet Laureate.